Born Tallin, Estonia, 16th August 1969. Disaster stakes for this talented racer last season when he injured his ankle in a collision with James Birkinshaw and then contracted blood poisoning. After a dis-spirited return to the saddle Rene was dropped in favour of Steve Knott in July. Finished runner-up in the World Junior Final in 1990 at Lvov, USSR, and joined Sheffield in 1993. Refused a work permit 12 months later, but now rides on a British licence and may soon become a full British citizen. His training this winter has taken the form of regular work-outs at Brendan Ingle's boxing gym at Wincobank, lets hope he can knock the stuffing out of the opposition on the track as well. After a storming start in 1998 from the reserve berth, often top scoring for the Tigers, Rene was promoted to heat leader in the July green sheets. Born Dewsbury, 15th May 1977. Former Bradford junior who rode for Newcastle in 1997 Andre has started posting some excellent scores around Owlerton and has been very sucessful on the World Championship trail. Qualifying from the British U21 final at Arena he followed this up with a consistent score at Straslund and a 12 point return in the semi-final at Abensburg where he was beaten by Nicki Pedersen in a run-off for 3rd place. The final was a major disappointment with Andre finishing at the foot of the field with only 3 points to his credit, but Andre should be proud of qualifying for his first World Final. Andre bounced back in style in his next home match when he scored 14 points against the Vikings in true heat-leader style, including beating Paul Thorp in the nominated riders heat. Born Sheffield, 26th June 1963. Rode for the Prowlers in '96 and surprisingly joined Berwick at the start of the '97 season but fell out with their management after a couple of matches. He was offered James Birkinshaw's team place in August as the Tigers promoters tried desperately to make the play-offs but suffered rib and back injuries whilst trying to avoid Phil Morris at Stoke in September. Derrol must be speedways foremost expert on safety fences and the most recent one examined at close quarters was at Berwick. The summer of '98 will be remembered fondly by Derrol's fans as he strings together some impressive performances around Sheffield including from the back victories over Mick Powell, Paul Bentley and Brent Werner. Born Nocton Hall, 29th March 1975. A former Boston mascot Steve began his career with the Sheffield Tigers before joining Div.1 Cradley. Left on the sidelines following the closure of Dudley Wood, Steve was optimistic about joining local track Skegness at the start of 1997 but was counted out of contention when his average was to high to fit in with the Braves team building plans. 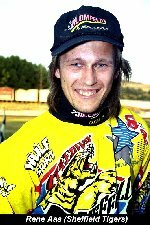 After a brief spin at a Sheffield practice session Steve was offered a place in the team and he returned to the saddle for the Tigers replacing René in July 1997. After struggling with machine problems and never setting the shale alight Steve was relegated to reserve in July in the first green sheets. Although this should have boosted his confidence he was not given the chance being replaced by Robert Larsen before his first home match at reserve. Born Holsted, Denmark 10th October 1970. Born Maidstone, 27th January 1971. Born Sheffield, 29th September 1972. Scott raced to several home maximums last season, but it is his all action style which endears him to the Owlerton supporters. Even when left at the start Scott never gives in and last to first dashes are commonplace. Scott's nickname comes from the (unguided) "Scud" missile. Born Manchester, 16th May 1972. Following the closure of Long Eaton on the eve of the season Carl was pleased to be quickly fixed up with his first choice track. A regular in the Owlerton bar last season Carl is looking forward to showing the fans that he knows his way around the track as well. His spectacular track style will surely be a hit and Carl has ambitions to finish as the Premier League's top man in '98. Shocked to be asked to become the new captain following Robbie Kessler's departure, partly because there were always more experienced members of his Long Eaton team in previous years, Carl was honoured and delighted to accept the extra responsibility. Always the type to help and assist his team mates as he never likes to be on the losing side, he acknowledged the vote of confidence from his new management. Carl has been chosen for the England squad by new England manager Dave Jessup and along with Peterborough's Glenn Cunningham will represent the Premier League at international level.